The Missouri River cuts across the state of Missouri from west to east, dividing the state in two before emptying into the Mississippi. North of the Missouri is a flatland heavily populated by cattle and corn. South of the river lie the rounded tops of the Ozark mountains, with their pleasant forests, streams, and springs. Many of the original settlers of the Ozarks moved west from homes in the Appalachian mountains, and they brought with them a tradition of independence and self-sufficiency -- like their Appalachian brethren, Ozark residents have long been admired for their ability to thrive with little outside assistance or even contact. Yet with each passing year the Ozarks grow more welcoming, as lake resorts, vacation homes, and rental properties sprout up, and the communities grow accustomed to a steady influx of tourists (and tourist dollars). The city of Branson, a center for live music and entertainment, is the biggest and most well-established draw, but the Ozarks' smaller communities beckon with increasing urgency. On the eastern edge of the state lies St Louis, just south of the junction of the Missouri and the Mississippi. The city's most famous icon is the Gateway Arch, erected in 1966, which commemorates the 19th century pioneers who passed through what was then a young trading post on their way westward. 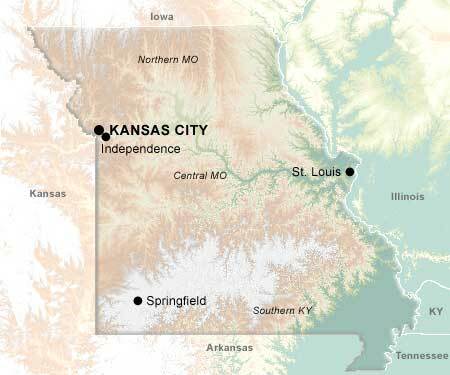 On the western edge, straddling the Kansas/Missouri border, is Kansas City, famous for its stockyards, its jazz, and the eternal question, "Kansas City, Kansas or Kansas City, Missouri?"